Today is Tag der Deutschen Einheit, German Unity Day, the day the two Germanies became one 28 years ago. It seems like a pretty good day to finally set this post free from my drafts folder, as it concerns a house that once straddled the border of West Berlin and Brandenburg (the ex-GDR federal state surrounding Berlin). 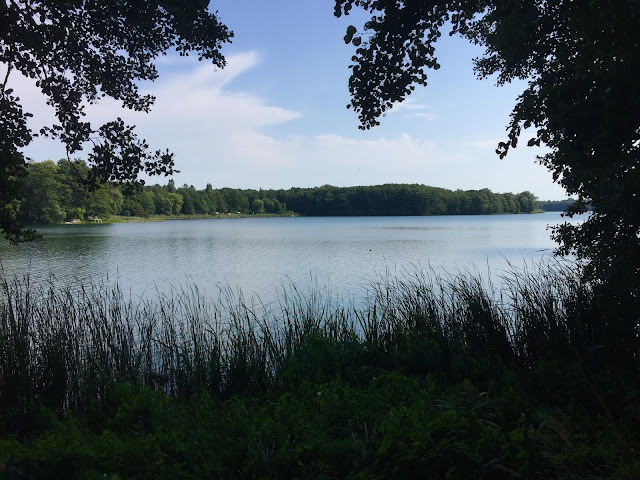 This summer, I read Thomas Harding's excellent historical memoir The House by the Lake (click through to see my review). I loved it, and I immediately vowed to go and visit the Alexander Haus. Even though I live in Berlin — which certainly brought many aspects of the book to life — it's not as if the house is just around the corner from me; it was actually a bit of a faff to get to, but I hoped it would be worth it. Start with a U7 ride all the way to its western terminus, Rathaus Spandau (a cool station that looks like it belongs in Legoland), followed by a change to the 638 bus, getting off at Ritterfelddamm. You can also get the X34 bus from Zoologischer Garten and get off at Gutsstraße (this is how I got back to Berlin, and incidentally, these are the start and end points on this route so you can't really go wrong. Also, this is definitely the more scenic route). 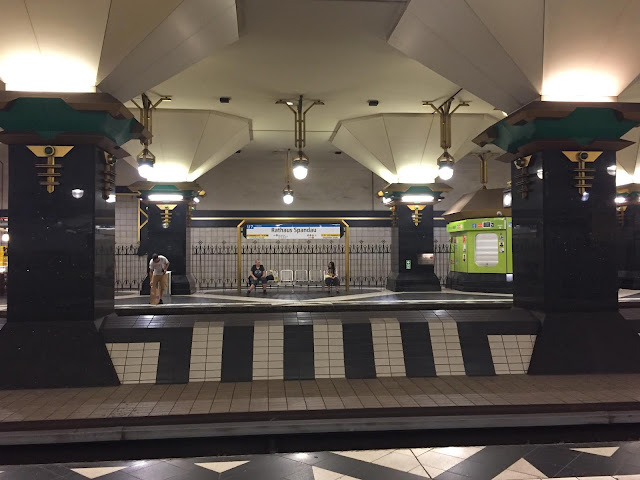 Both Ritterfelddamm and Gutsstraße are just about located within zone B but are a walkable distance to zone C, meaning you only need an AB ticket and can thus save yourself €0.60 if you wish. You'll walk down Gutsstraße, which is actually a little track splitting a caravan park and a few houses. 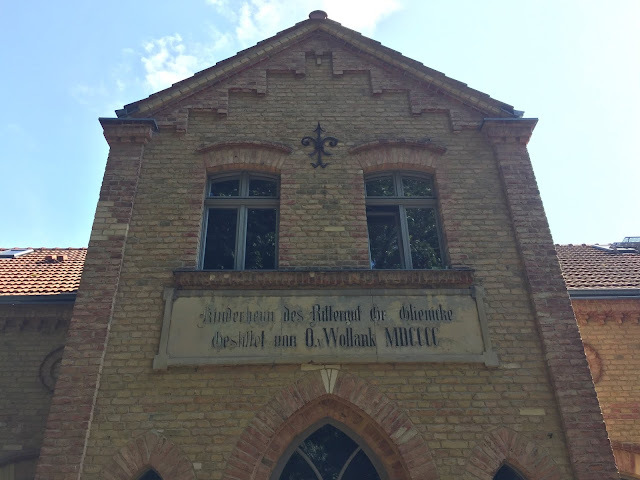 It skims the Gutspark, which is the remnants of the estate once belonging to Otto von Wollank (son of Adolf Friedrich Wollank — for whom Wollankstraße in Pankow is named, just in case the name rings a bell). An orphanage, but I can't find any information about it — it was possibly mentioned in the book, but I don't have it to hand right now and can't remember. The remains of the Berlin Wall will soon come into view. The map-official border between Berlin and Brandenburg runs right through the lake, but since you can't exactly erect a wall in the water (at least not as efficiently as they wanted to), they instead built it running around the lake's western edge. 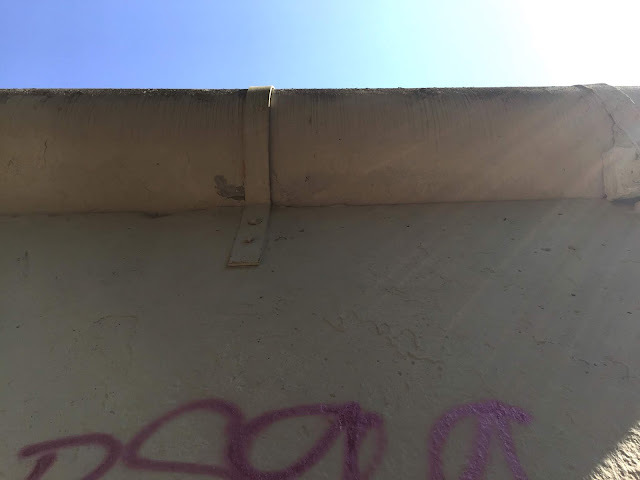 Even though I have now seen the Wall many times, given that its remains are dotted in various places around Berlin, this bit of it felt particularly poignant and spooky; perhaps because it was located way out in the country and seems so out of place and aggressive in an area that's otherwise very idyllic. 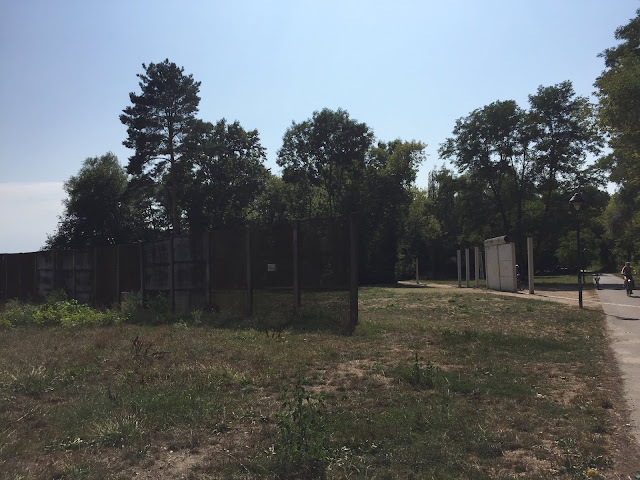 The Wall not only cleft the village in two — it also prevented a whole generation of Groß Glienicke inhabitants from enjoying the lake. I mean, imagine having bought a house literally because it was right by a lake, then one day you woke up to see a great big barrier being put up, and could only assume it would stay there forever! 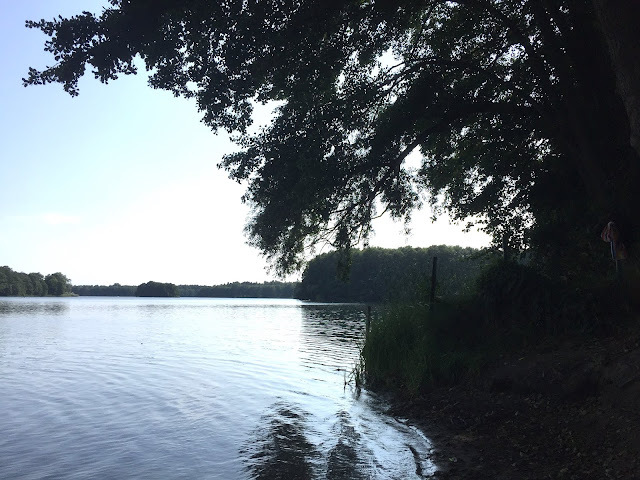 Rather than being shared by residents both of Berlin and of the state of Brandenburg (East Germany), the lake now sat firmly in West Berlin. On the left, the Vorderlandmauer, while the concrete wall is the Hinterlandmauer. The lake itself was lovely and peaceful, and given the heatwave, it was refreshing to have a little paddle (for over two weeks, we'd been suffering with temperatures up to 37° — and to any people from hot countries who are scoffing at this, Germany doesn't have any sort of air conditioning infrastructure). The Alexander Haus was closed for renovation and thus inaccessible from its address on Am Park. However, not far from the cove where I dipped into the lake, I could view it from behind a fence. I can't tell you how moving this was, especially imagining the various residents whom I'd read about walking just down the slope to the lake, seeing exactly the same thing that I saw. 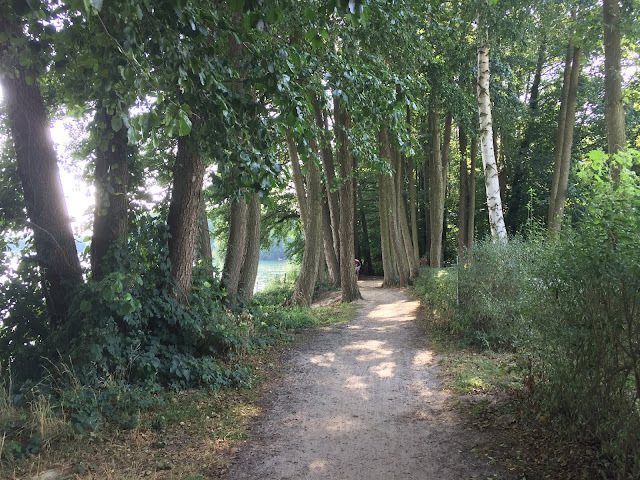 If you follow the track, you can then walk out to Potsdamer Chaussee, which is sort of the main road that runs through Groß Glienicke. You'll find yourself under the Gutstor. I stopped for a sip of lemonade and some chips (the fat, fluffy kind!) at a Greek restaurant, then took the bus home. I would have liked to stayed longer and explore the Gutspark a bit more, but unfortunately I only realised that's what it was after the fact. From the outside, it looked like a load of forest and unkempt bushes. It's these places on the various margins of Berlin that interest me. I feel a sort of protectiveness and desperation towards them, like they're the salt of the earth yet also slowly disappearing out of reach. And even if I were to make a weekly trip to Groß Glienicke, I would probably still never shake off this separation anxiety.